Update: The City of Boston Inspectional Services Department has shut down King Smoke Shop for failure to have proper permitting. Looks like an employee of the new King Smoke Shop on East Broadway was selling more than bongs and cigars. According to City Councilor Ed Flynn, Boston police confirmed that an employee was arrested for selling marijuana and edibles out of 600 East Broadway. Evidently, concerned neighbors were suspicious of the activity at the newly opened smoke shop and took their concerns and suspicions to the BPD and an arrest was made. “Great work by the residents and parents that brought the information to the police,” said Flynn. Now that’s “taking a bite out of crime” – McGruff the Crime Dog! BPD Officers Arrest Store Clerk for Unlawful Sale of Marijuana Cigarettes and Edibles in South Boston: Acting on several community complaints and concerns relative to the unlawful sale of marijuana and marijuana-infused edibles out of the King Smoke Shop at 600 East Broadway Street in South Boston, detectives assigned to District C-6 (South Boston) with help from both the District C-6 (South Boston) and District A-1 (Downtown) Drug Control Units initiated an investigation to better understand the facts and circumstances fueling the concerns. As a result of the investigation, which included undercover purchases of marijuana inside the store, officers were able to accumulate sufficient evidence and cause to charge two employees of the establishment with the unlawful sale of marijuana. On today’s date, Monday, February 11, 2019, an officer working in an undercover capacity entered the establishment and purchased several marijuana cigarettes. In light of the illegal purchases, investigators arrested Saqib Imran, 38, of Brockton and charged him with Possession with Intent to Distribute a Class D Drug (Marijuana). Additionally, officers charged the owner of the store, Tanveer Shah, 61, of Bellingham with Possession with Intent to Distribute both a Class D Drug (Marijuana) and a Class C Drug (THC). Soon after the arrests, a search warrant was obtained in order to properly quantify and catalogue the store’s illegal marijuana inventory. During the search, officers were able to locate and confiscate multiple marijuana cigarettes and marijuana-infused edibles and candies. Both individuals are scheduled to be arraigned on Tuesday, February, 12, 2019 in South Boston District Court. Weekend Picks – April 26th – have some fun in Southie! 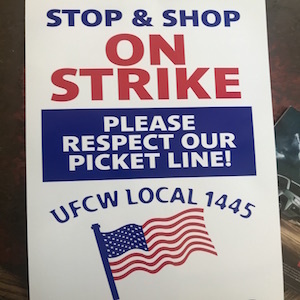 Stop & Shop strike is over – employees are back to work. I’d like to see what city does in this case? If a bar served to those under 21 to an equivalent degree, they would be shut down for a few days. A slap on the wrist fine is like doing nothing. A bar also has a license to sell liquor. This smoke shop did not have a license to sell weed. Completely different situation. Were they selling to underage kids? I didn’t read that anywhere. Multiple sources cite “parents” as a the people inciting the investigation, so it is assumed that is what led to the undercover operation. It is not proven, just alluded to. And remember, “underage” is anyone under 21. I don’t really consider a 20 year old a “kid” but they are underage. Since these are felony charges, the shop should lose its CV License. The owner, if convicted, should be barred from ever operating any establishment in the City of Boston. I heard these guys were “gifting” people weed with the purchase of certain items. I got into an argument with this person over the legality of this sort of transaction. I’m thinking I may have won this one. These guys were already taking heat for opening this business, they deserve whatever they get for being this dumb. Common sense is just not very common anymore. Common sense fell by the wayside–years ago. “vials of THC” Sounds so scary!!! !